Successful racers often use visualisation techniques before a race. This tends to involve picturing the “perfect” race, and how you want it to pan out in an “ideal” world. Of course, this is unlikely to actually happen in reality, but it can help to focus your mind in preparation for the race ahead. Many drivers also like to spend some time before the race picturing the circuit and working out how they will approach the corners and other challenges. 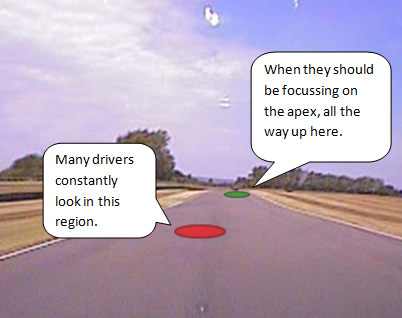 To be consistent in your driving you should find reference points around the track that you can use as markers for braking points / turning in points. Take this Ariel view of Brands Hatch, the turn in point of this corner is exactly opposite an exit road. So as you’re coming in to that corner you can use that road as a visual reminder to turn in. Other visual markers could be a crack in the tarmac, a point on a curbing, a change in tarmac, a marking on a wall on the side of the track, a marshal box etc. Notice, though, I do not mention anything that could move during a race such as a shadow or a marshal. It’s even more important to have more reference points in the rain, ideally higher off the ground because visibility is such a problem. The three most important reference points used to help guide you through corners are: turn in point, apex and exit point. The ultimate goal is to combine all three into a smooth, fluid line through a corner by connecting the dots first visually and then physically. * corners that open up to another corner. Typically corners that open up to long straights are considered the most important because the car spends most its time on the straights, and maximizing the top speed at the end of a straight ultimately provides the best passing opportunities. Corners that lead to other corners are taken at less than the optimum classic line in order to be sure the last corner (the one leading to the straight) is optimized. In addition to this priority set, we must look at the speeds of the corners involved. The high speed corners are more important than the slower ones. This is due to two factors: first high speed corners are usually long which means the car spends more time in them than in slower and shorter corners. Secondly, the car cannot accelerate through or out of a high speed corner as quickly as it can a slower corner. In other words its harder to make up for lost speed at 100 mph than it is at 60 mph. How can you drive somewhere when you don’t know where you’re going? If you haven’t seen the corner coming up, how do you know how tight it is? If you don’t know how tight it is you don’t know where to position the car, when to brake, how hard to brake, how long to brake for, when to start turning, how much to turn, when to start releasing the steering lock…. you can see where I’m going with this right? Lets take a simple 90’ right hander with a long straight both before and after. Lets assume you’ve done a few laps of the circuit and you are happy with where you’re going and have a rough idea of the correct racing line. You’ll have positioned the car on the left hand side of the track and at the earliest opportunity, you need to look through the corner. Then, you’ll pick out the reference points you have gained from previous laps as to where you are going to brake. From there, you need to look ahead to the point where you will be turning. This is very important because at the point of turning, you can’t be looking directly at that reference point. You’ll be using your peripheral vision to gauge this. So, it’s imperative you have a picture of that in your minds eye. Once you have started your braking, you should be turning your head ‘into’ the corner and picking your clipping point or ‘apex’. This is way in advance of actually turning the steering wheel. As you start to bleed off the brakes and turn the wheel into the corner, your vision should now start to transfer towards the exit point. Allowing the car to almost guide it’s self through the corner. This can only be achieved by turning your head. A lot. More than you’d think in fact. Your head should pivot on the points you are driving towards even if that is out of the side window. 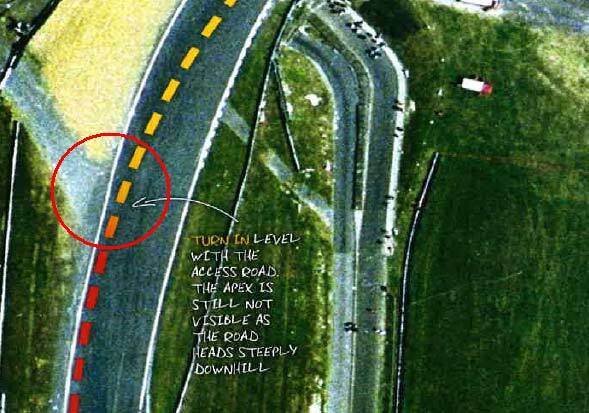 If Sometimes, if a driver are travelling through a tight chicane, their head could be pointing in completely the opposite direction from their current trajectory because where the head is pointing, the car is going next. you know about that because you looked at it 300 meters ago.